Heritage Ohio presented the “Main Street Business of the Year” award to the Paisley Monkey of Lakewood, Ohio. 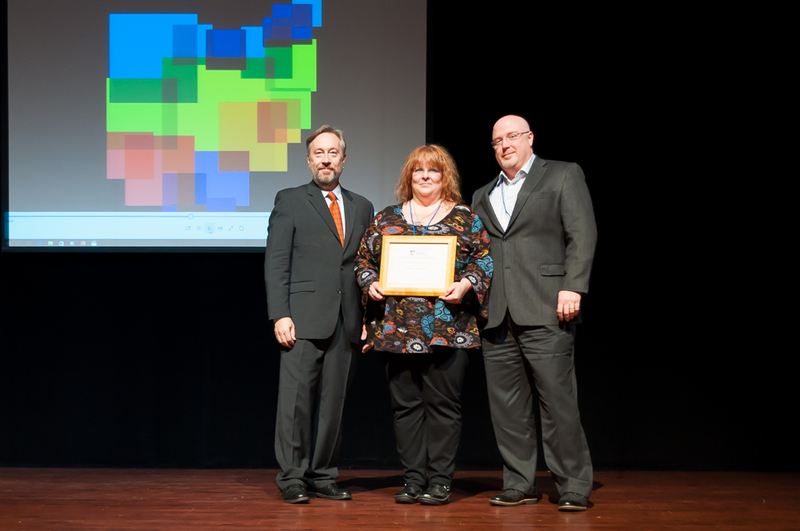 The award was accepted by Tamara Racin and Thomas Mohney on behalf of the Paisley Monkey Tuesday, October 6th at Heritage Ohio’s Annual Revitalization and Preservation Awards Ceremony held at the Historic Southern Theatre in Columbus. The Awards Ceremony is held in conjunction with Heritage Ohio’s Statewide Conference. In 2010, Paisley Monkey, initially an online shop for children’s clothing, gifts, and products, opened its doors to downtown Lakewood in a cramped storefront located on the side block of a bank building with no neighboring retail businesses. Confined to 350 square feet of real estate, the store was committed to featuring quality clothing and gifts as well as their famed customer service. Before long, Tamara Racin, owner of the Paisley Monkey, began her involvement with Lakewood Alive and the rest is Main Street success history. Tamara invested in the city of Lakewood through volunteer work in several capacities from supporting local business to establishing events to helping found the Lakewood Downtown Business Alliance. Tamara’s sweat equity investment in the city and its citizens paid off as the Paisley Monkey’s retail space tripled in 2011 and continued its growth by doubling in 2013 at its current 14417 Detroit Avenue address. Paisley Monkey now offers over 1400 unique gift items and continues to invest in Downtown Lakewood as the proud Harmony Sponsor for LakewoodAlive’s Front Porch Concert series. Many communities, organizations and individuals submitted nominations for consideration. The Selection Committee reported a high level of quality in nominations, awarding 16 categories at this year’s event. The awards recognize the numerous preservation and revitalization accomplishments of downtowns and neighborhoods across the state. Heritage Ohio is the statewide, not-for-profit preservation organization, dedicated to encouraging and assisting people and organizations to protect, preserve and revitalize Ohio’s heritage. Formed in 1989, Heritage Ohio has members ranging from individuals and households to organizations and local governments. In 2002, Heritage Ohio was designated as the statewide partner of the National Trust for Historic Preservation. Heritage Ohio encourages the development, redevelopment and improvement of downtown and neighborhood commercial districts. Heritage Ohio works as a catalyst for downtown development by bringing together downtown organizations, conducting statewide seminars and conferences and providing a network to share knowledge, common experiences and challenges concerning downtowns. Learn more at www.HeritageOhio.org and www.LakewoodAlive.com.